Shirin Neshat, Roja, 2016. Single channel video installation. © Shirin Neshat. 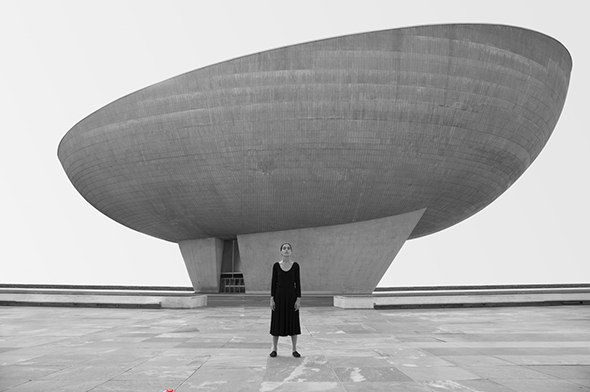 Dirimart is pleased to announce DREAMERS, an exhibition by Shirin Neshat. The show will include two video installations; Roja (2016) and Sara (2016) in addition to a series of new photos titled “Dreamers.” Each video revolves around single female protagonists whose emotional and psychological narratives remain on the border of dream and reality; madness and sanity; and consciousness and sub-consciousness as they each face their own distinct inner anxieties. These beautifully shot, black and white films share similar surrealistic and dreamy visual effects. Based on aspects of the artist’s own recurring dreams, memories and sense of longings; Neshat manages to achieve a haunting quality through simple, non­linear narratives and effective use of subtle camera techniques. In all the works, natural landscapes and distinct monolithic architecture become dominant aspects of the brief narratives, which indirectly investigate issues of gender, power, displacement, protest, identity, and the space between the personal and the political. Sarah is an unfolding journey of a woman as she recollects and breathes annihilation, while facing residues of history, destruction, and mortality. What remains at the core of this narrative, is Sarah‘s fears which at last force her to plunge into imagining her own death. While intimate and personal, Sarah reflects on today’s global sense of anxiety against extinction, violence and genocide. Roja is an evocative piece, loosely based on the experience of “nostalgia” by an Iranian woman who feels deeply divided in between Eastern and Western cultures and landscapes; desperately seeking a notion of “security,” “homeland” and a “mother figure” which prove to be both sympathetic and yet terribly threatening. DREAMERS leaves the audience with the same question in mind, will the world ever heal from victimizing the displaced, the vulnerable and the protagonist? Shirin Neshat (b.1957, Qazvin), is an Iranian artist and filmmaker living in New York. In 2009, Neshat made her first feature length film, Woman Without Men, and was awarded with Silver Lion prize for Best Director in the Venice International Film Festival. Neshat’s current photo series include ”The Book of Kings” (2012), “Our House Is on Fire” (2013), and ”The Home of My Eyes” (2015). Stedelijk Museum, Amsterdam; Serpentine Gallery, London; Hamburger Bahnhof, Berlin; Walker Art Center, Minneapolis; Musée d’art contemporain de Montréal and the Detroit Institute of Arts are among the museums where Neshat’s artworks are exhibited. Holding a recent exhibition in Hirshhorn Museum and Sculpture Garden in Washington, DC, the artist participated in the 48th Venice Biennial (1999), Whitney Biennial (2000), Documenta XI (2002) and Prospect 1 New Orleans (2009). Awards she was granted are: Grand Prize at the Gwangju Biennial (2000); First International Prize at the 48th Venice Biennale (1999), the Golden Lion Award; Hiroshima Freedom Prize (2005); and the Dorothy and Lillian Gish Award (2006). Neshat is working on her second feature-length film, which is about the life and art of the legendary Egyptian singer Uum Kulthum. Heinz Peter Schwerfel (b.1954, Cologne), is filmmaker and art critic living In Paris and Köln. He has been writing for the German ART Kunstmagazin, for Lettre International and ZEIT, among others, and has published many books on contemporary art. On artists such as Georg Baselitz, Jannis Kounellis, Markus Lüpertz, but also essay books such as Scandals in Art, Art after Ground Zero or Cinema and Art, a comprehensive overlook about the relationship between contemporary art and Hollywood, translated also to Turkish. His films on Georg Baselitz, Rebecca Horn, Bruce Nauman, Alex Katz, Christian Boltanski and many others have been shown in retrospectives all over the world. He is currently finishing for French and German TV a series on new forms of art and exhibitions called Live Art, conceived together with Hans Ulrich Obrist, featuring artists such as Marina Abramovic, Joan Jonas, Philippe Parreno, Tino Sehgal, Adrian Villar Rojas and others. Heinz Peter Schwerfel is founder and artistic director of the festival Kino der Kunst, Munich, focussing on fictional films from artists. In Istanbul, he has curated several shows for Dirimart Gallery, such as Nuri Bilge Ceylan, Isaac Julien, Shirin Neshat and Jesper Just.